Join the Gulf Coast Bird Observatory for our second annual Brew on the Bayou here in Lake Jackson. Come sample and enjoy specialty brews from local breweries as well as wines. Listen to live music, grab a bite to eat from local food trucks and check out some hot items at our silent auction. Our beautiful wooded grounds will be lit by torchlight making it a perfect spot to enjoy the brews, the food and the music! 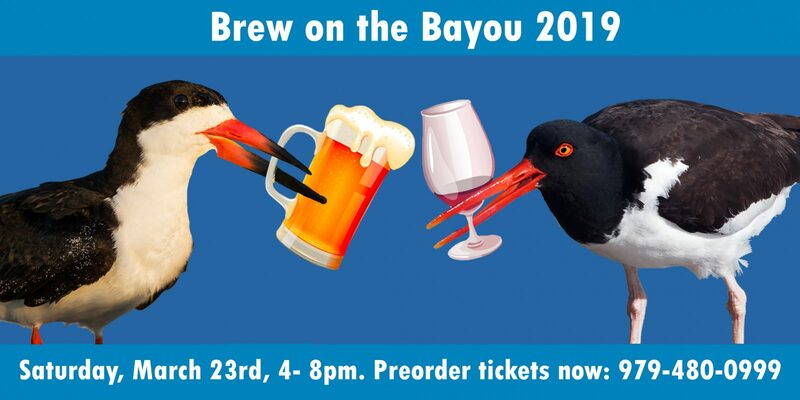 Brew on the Bayou takes place on Saturday, March 23rd from 4 pm to 8 pm at The Gulf Coast Bird Observatory: 299 HWY 332, Lake Jackson. Tickets are $20/person with presale, $25 at the door and can be bought either by calling us in advance at 979-480-0999 or during the day of the event. ID required at door for brew-tasting. Supporting our wildlife conservation work with your ticket purchase!